I am back with another tutorial today, in collaboration with Elephant In My Handbag – this time it’s a really quick and easy project that anyone with a sewing machine should be able to whip up in no time and something you could give a go if you have been thinking about trying sewing but are a bit nervous to get started! We are talking bunting! 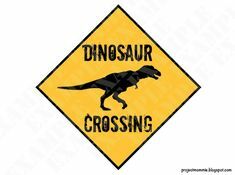 The mini ‘theme’ that I picked for my baby’s nursery (before I knew if I was having a boy or a girl – if you missed the announcement last week check it out here!) 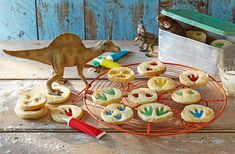 was rainbow colours, bunting and stars. Yep – that’s a pretty random theme, but I had a vision in my head and thought it would look pretty cute. 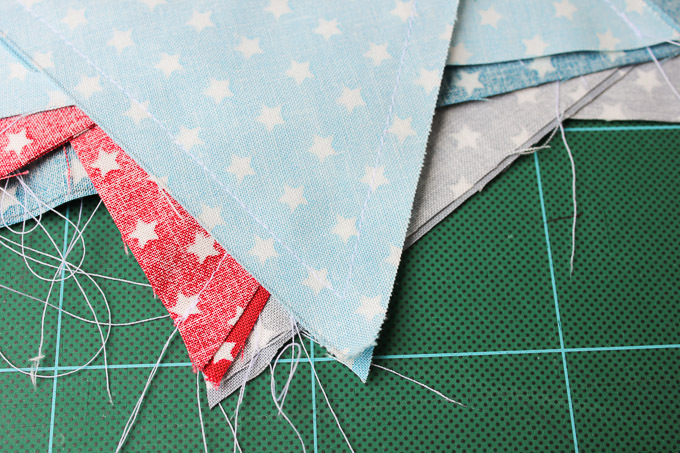 I came across this gorgeous bundle of star fabric by Makower on the Elephant In My Handbag website and just KNEW that it had to become bunting for the nursery (and a baby quilt – but more on that in another post!). 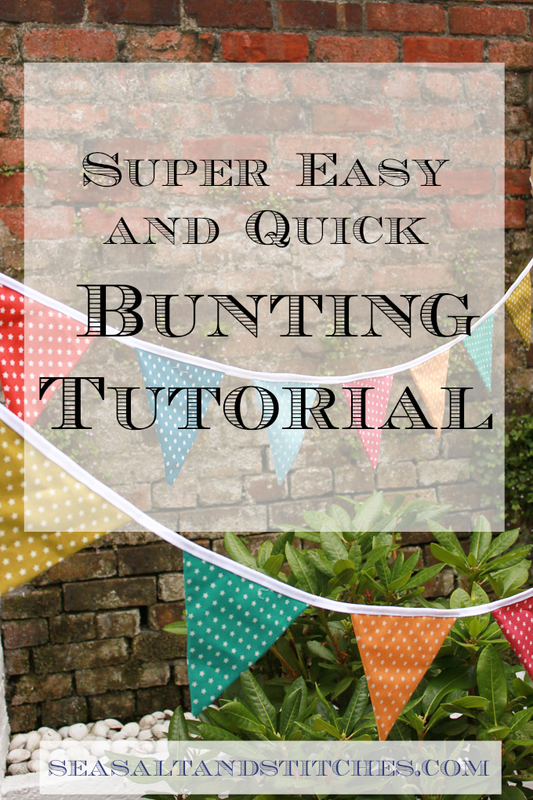 If you would like to try your hand at making your own bunting then why not give the tutorial below a go. You could use any fabric you like of course, and it could be all the same fabric rather than multi-coloured like I’ve gone for. I have also made ‘reversible’ bunting in the past, where I’ve made the triangles in a different fabric on either side, so that’s another idea for you. 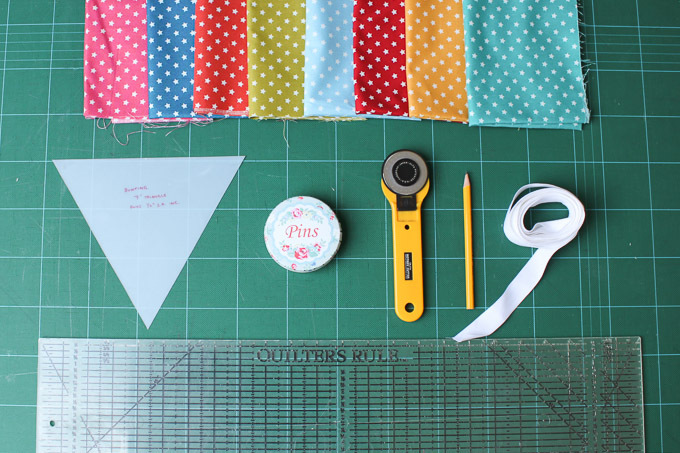 And finally, this tutorial is really just a guide – bunting comes in all shapes and sizes, so feel free to make your triangles any size you like, and space them out as you feel suits. a. Using your template and a pencil, trace triangles onto the reverse side of your fabric. 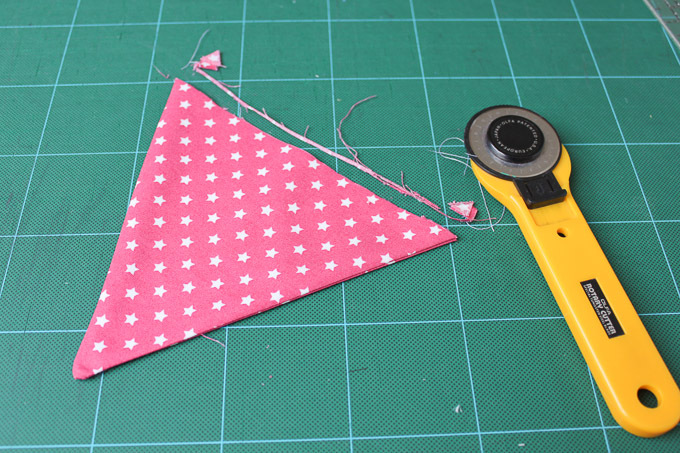 Remember each bunting piece requires two triangles, so make sure you cut an even number. Also be aware of pattern placement and orientation if your fabric has a specific design. 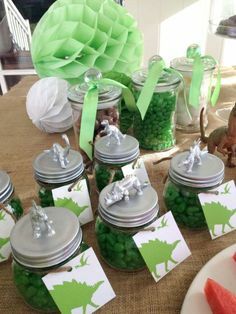 c. Cut as many pieces as you would like for your bunting. 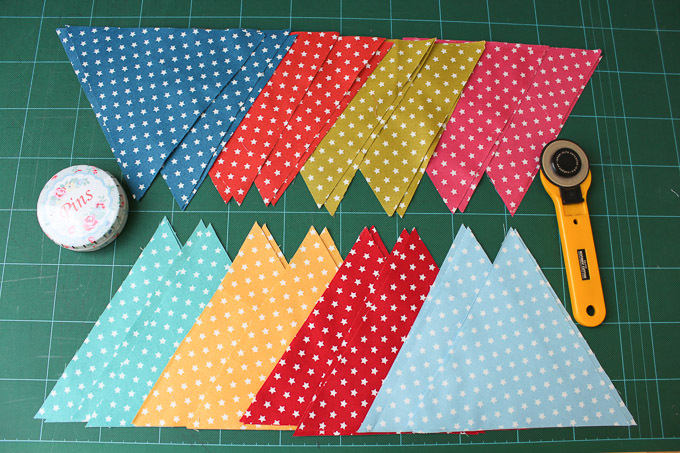 For my example I am making two rows of bunting, each with matching colours so in the photo above you will see I have cut 4 triangles of each colour. b. Trim off the seam allowance at the point of each piece – see photo below. Be careful not to cut TOO close to the seam! c. Turn each piece right side out and push points out as much as possible (you can use a pencil or knitting needle to help you do this, but be careful not to poke through the fabric!). Press with a hot iron. d. Trim the tops of each triangle – see photo below. 4. 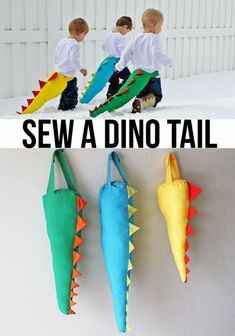 SEW BUNTING PIECES ONTO TAPE AND FINISH! a. Leave about 50cm of tape, which will allow for tying your bunting up (you can vary this length as you see fit), and then position your first triangle. Position the open top of the triangle half way up the width of the tape, fold the other half over the top of the triangle and pin in place. b. Measure 2″/5cm from the right hand corner of the triangle and then position your next triangle. See the photo above. Pin this triangle in place. c. Repeat until all triangles are pinned in place. Remember to leave another 50cm length of tape at the end. 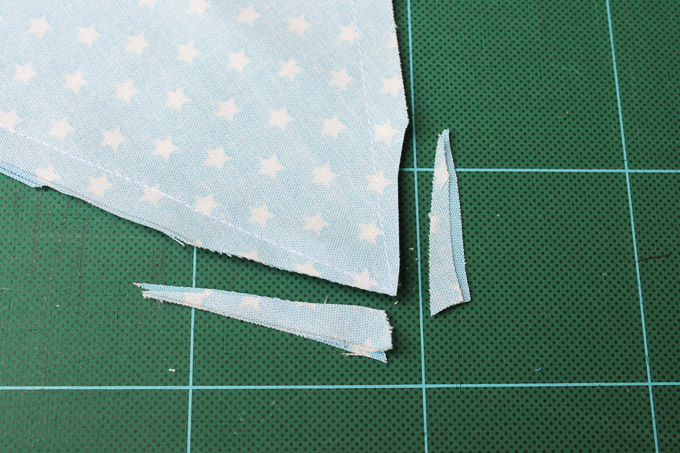 d. Starting at one end, fold the cotton tape in half and sew together, about 1/8″/3mm away from the edge. Once you get to your first triangle keep sewing, but just make sure you are catching all pieces (creating a sort of sandwich of tape-triangle-tape). Continue until you get to the end of the cotton tape. 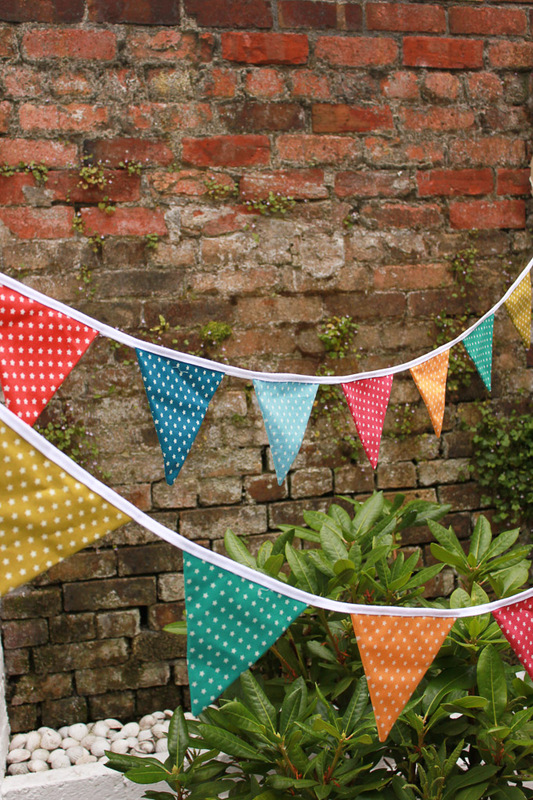 e. Press if necessary and then string up your bunting and make somewhere look extra pretty! So there you have it! I told you it was quick and easy. 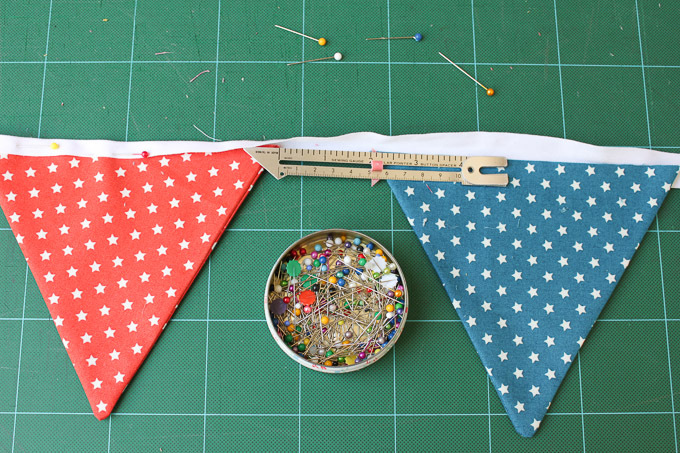 If you make some bunting using this tutorial I would love to see it – please do let me know!! 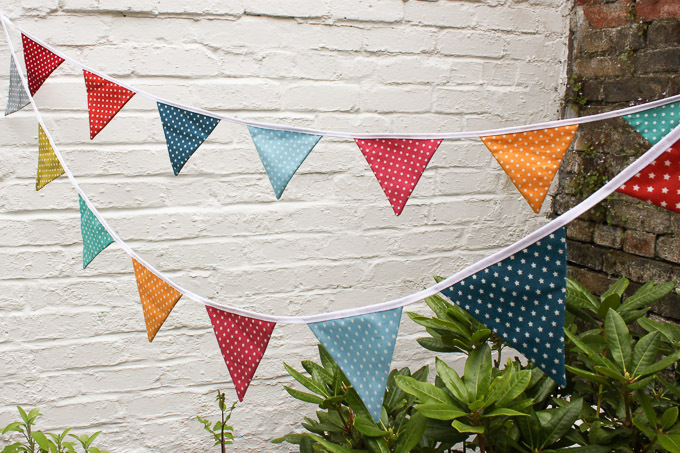 I can’t wait to hang this up over my baby’s cot, but since we are planning a move in the next month I don’t really have a nursery yet, so for now I have the bunting decorating our outside courtyard. And I am loving the vibe actually! Pimm’s anyone?